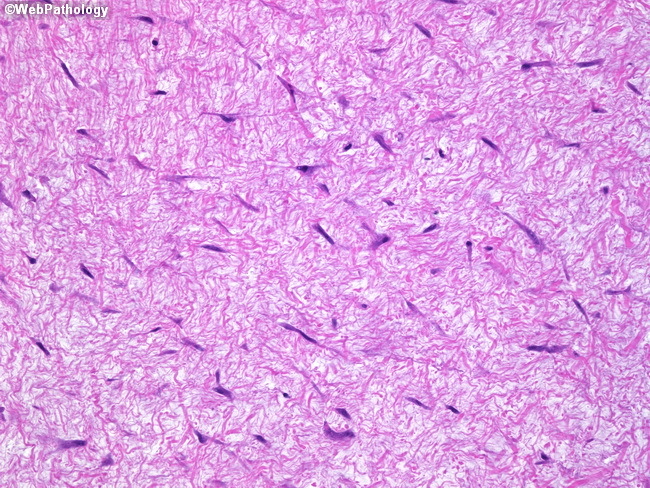 High-power view showing stellate nature of many of the cells. Most lesions are hypocellular and show heavily collagenized stroma. Foci of increased cellularity may be present; however, such areas almost always will be seen merging with more typical hypocellular zones. The periphery of the lesion may contain cleft-like vascular spaces. The biologic behavior is benign. Local recurrences may occur in one-fourth of cases which can be treated by re-excision.